Floyd County, Kentucky is where we focus our efforts in Appalachia, specifically the 22 miles of State Route 122 that runs between the towns of Martin and Wheelwright. 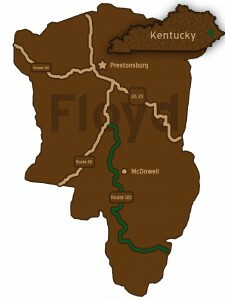 Floyd County is a part of the Cumberland Plateau of the Appalachian Mountain Range. The wooded hills range in elevation from 641 feet to over 2,000 feet. Floyd County has a rich heritage that ranges from the Adena Indians (mound builders) who are thought to have been the first inhabitants, through two civil war battles, to the coal camps that sprang up and faded as fast as the coal could be mined. The county has now become a center for art and music in the region through the Mountain Arts Center.